To say that Bill Rosendahl wore many hats over the course of his decades-spanning career would be the height of understatement. Politician, psychiatric social worker, corporate executive, television personality, LGBT and human rights advocate, educator, mentor—the New Jersey-born son of German immigrant parents has lived a life that has the shape and heft of a novel. He worked for Robert Kennedy and John D. Rockefeller III; hosted a public affairs television series for years; fled death threats in Ethiopia on horseback; and served as an openly gay member of the Los Angeles City Council, representing Council District 11, from 2005 to 2013. Yet for all his success and acclaim, Bill never rested on his considerable laurels. At the age of seventy, he still “fought the good fight” for social justice and equal rights for all. At the age of twelve, Bill realized that he was gay. Like so many gay men of the baby boom generation, he buried it deep inside himself, keeping it secret while channeling his pent-up sexual energies into excelling at school and extracurricular activities. Twenty years would pass before Bill came out to his family at his mother’s funeral—and embraced life as a proud gay man. Of course, Bill’s extraordinary journey from closeted New Jersey teenager to revered LGBT and human rights advocate has not been easy. He’s was gay bashed and endured homophobia in the workplace; he lost his first partner, Christopher Lee Blauman, to AIDS in 1995; and he was diagnosed with stage four cancer in 2012. Faced with such hardships, many would retreat or succumb to despair—but not Bill, who repeatedly bounced back from tragedy with resilience and a renewed sense of purpose. Told he would not live to see the November 2012 presidential election, Bill simply refused to accept his grim prognosis. It’s this fighting spirit, combined with his passion for social justice and commitment to demystifying egregious LGBT stereotypes, which enabled Bill to defy the medical odds. Bill lived a relatively quiet life in Mar Vista, California, tending to his garden and his animals. 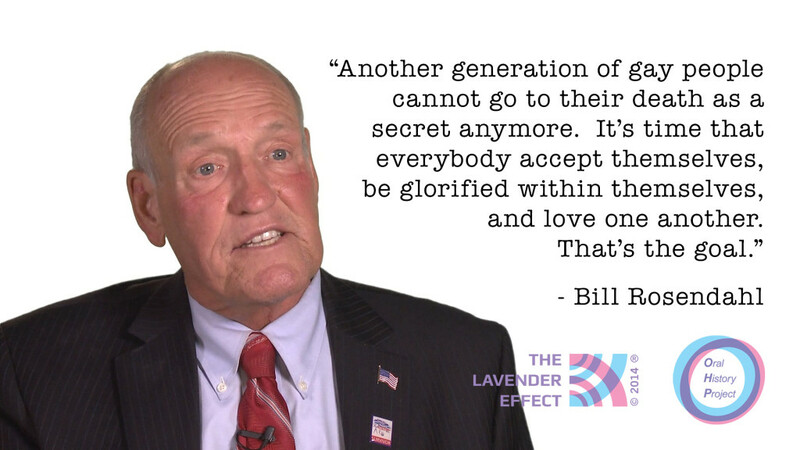 And although he left office in 2013, Bill Rosendahl continued to be a force for change—and an inspiration to LGBT politicians and activists everywhere. Known for being quirky and loud and extremely nice. Motivated by giving back.